Situated between Belfast and Dublin, Ireland’s smallest county on the East Coast offers visitors a wealth of attractions and activities, varied landscape and unspoilt scenery to guarantee a truly memorable holiday. 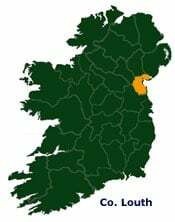 The County is steeped in myth and legend, forever associated with the Tain Bo Builigne, the famous Celtic Legend of the Cattle Raid of Cooley. A link between North and South, The Cooley Peninsula is noted for its scenery and its historic sites. Here heather covered mountains sweep down to the sea at Carlingford Lough and is ideal walking country along the Tain Trail and for cycling “The Tain Cycling Route” which stretches from Roscommon to the Cooley Peninsula. King Johns Castle commands Carlingford Lough in the picturesque Heritage town of Carlingford.